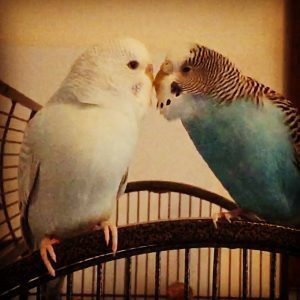 As regular readers know, I have two female parakeets (Toby and Kelly) living together in a little sorority. This is far from ideal, female parakeets tend to be more aggressive and territorial than their male counterparts. Typically you would want to either have multiple males, who would be great “bros” and just hang out and play or a male/female pairing, in which the male would naturally take a back seat and let his lady have her way. If you want to have a larger flock than two: a. I’m very jealous because I wish my house was full of parakeets and b. from what I understand you can have a large flock of just males and they will be very happy, or almost any amount of males and females, as long as it’s an even number so everyone can pair off if they want to have close a bond with just one other parakeet. In my experience with two females, you get a minimal amount of hanging out together, preening and regurgitating, but mostly it’s either playing separately or squabbling over various resources, regardless of the relative scarcity of the resources in question. I don’t have the biggest flight cage on the market, but it’s certainly large enough for two to live comfortably. I also have three water sources and two food bowls, but it really doesn’t matter, whatever Kelly has Toby wants, and vice versa. Usually these disputes are resolved with a minimum of screaming, beak-banging displays of ownership and the occasional sword-fight of beaks, but on a rare occasion we have had some real knock down drag out melee style battles. Most recently they were fighting over a small toy while Patrick was working from home, the yelling was so loud he came out of his office to check on them and witnessed Toby tackle Kelly at the top of the cage, they both fell to the bottom and proceeded to roll around on the floor looking like something out of a cartoon. He broke it up by speaking sharply to them and also removed the toy. It also doesn’t help that Kelly has been in breeding condition, which Toby somehow manages to never go fully into, thank goodness. I have to be so careful about not giving them any toy or hut that is nest-like or can easily be perched on and defended. I made precisely that mistake with this Sea Grass Hut , which was on a play gym, so I rationalized that limiting their time with it would keep it from becoming an embattled object. For a while they would play on it and hang out very companionably, looking every bit like a little girl gang. Of course as Kelly got further into nest mode the sea grass hut became “hers” and she began defending it viciously. The last incident she bit Toby’s toe hard and I was concerned she had caused a serious injury, Toby immediately retreated to the cage and wouldn’t put weight on that foot. There was no visible damage and after a short while Toby was totally back to normal. The sea grass hut was immediately removed and no other item has created quite that much ire. 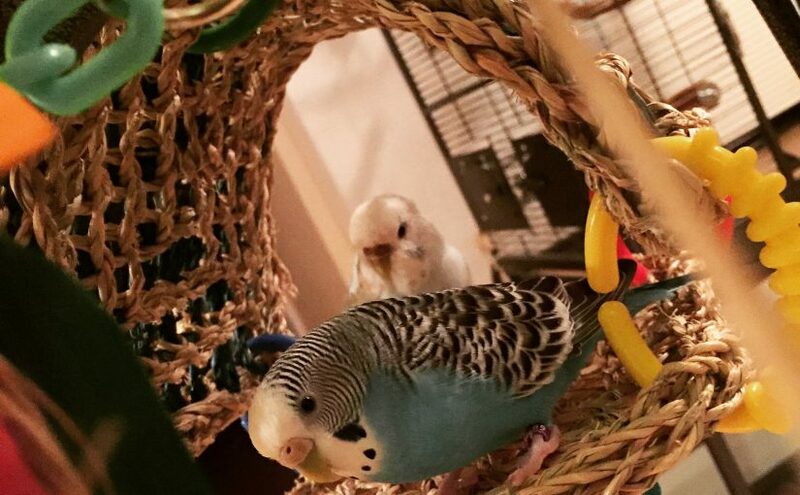 A lot of people, many of them parakeet experts who I respect, would say that Toby and Kelly should never be housed together, and that the aggression will inevitably escalate until one of them becomes a murderer. 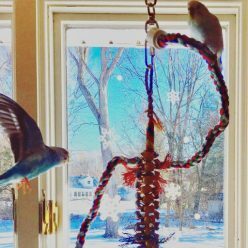 I do have a Small Vision Bird Cage as well as our original Prevue Park Plaza Bird Cage that they could be separated into if the need arose, but the times they are so sweet to one another makes me want to keep them together. 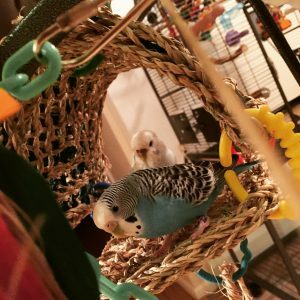 Also I know they like sleeping in the same cage (once finished with their perch dominance routine) and I believe it makes them feel safer. As much as they squabble when they are “at home” they really do enjoy each other’s company. I have to accept that I’m perpetuating a potentially dangerous situation, and I need to be able to live with my decisions if something does go drastically wrong someday. Weighing the options I think the risk is worth the reward, knowing how unsettled Toby was when she lived alone and how much Kelly has enhanced Toby’s ability to try new things and explore. 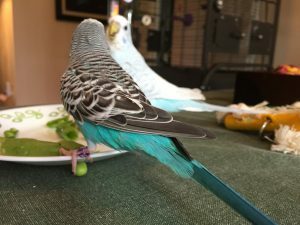 In a perfect world I would get them each a mature male boyfriend and expand the flock, but with my husband’s allergies there’s no way he could handle the 100% increase in feathers!